In his continued move to be better informed and to be acquainted with Seychelles Eco-tourism sites which should be working to increase the yield from the tourism industry for the country’s economy, Alain St.Ange, the Seychelles Minister for Tourism and Culture, responded favorably to an invitation by Dr. Nirmal Shah of Nature Seychelles for an island-hopping visit to Cousin Island with a stop on Curieuse. Nature Seychelles is a non-government organization managing Cousin Island on behalf of Bird Life International. 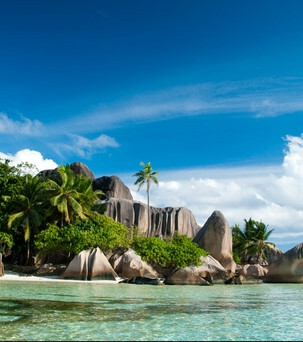 Curieuse Island is the island of the Seychelles where the endemic Coco de Mer nut grows naturally as it does on Praslin. Curieuse Island was originally a confinement for leprosy sufferers from 1800-1900, but the island is today a gateway for tourists visiting from boat charters, yachts, and cruise liners. The island’s unique vegetation, its walkways crossing over the rich mangrove swamp that creates a feeding ground for fish and hawksbill turtles, are just some of Curieuse Island’s many assets that should be attracting visitors to the island. While the drop off on Curieuse Island is more favorable at Baie Laraie, the ranger’s station with its high population of giant tortoises at Anse Badamier on the northern coast of the nature reserve emerged as the more frequented of the two sheltered moorings for yachts, cruise liners, and boat charters. The value of Curieuse Island conservation to tourism remains the island’s ability to attract visitors who pay a fee to land on the island. Visiting yachts also pay a fee per boat. The only tourism developments are the two barbecue sheds at Baie Laraie and at Anse Badamier. The latter is built close to a gracious national monument building, the Doctor’s House historical museum. The soaring number of tourists and locals flocking to the island start their discovery at this designated area before venturing into the nature reserve. “Curieuse Island has an immense potential to play a role in increasing the yield from the country’s tourism industry. They can tap into the islands’ Eco-tourism followers. It is impressive to see that this island also had real potential for cruise tourism. As the Ministry of Tourism and Culture, we are here to continue to encourage this market, but only if it’s done in line with our islands’ Eco-tourism sustainability programs,” Minister St.Ange said. Minister St.Ange also thanked Nature Seychelles for making this trip to Seychelles national park possible. “It is important for the Ministry of Tourism and Culture to give credit to Nature Seychelles, because without the invitation of this non-governmental organization, this visit would not have taken place,” the Minister said.